People have always tried to find solutions to improve the odds of winning the lottery. There are tremendous amounts of reports and software to help you beat the odds. Many of them are useless or scams. There are also a few good ideas to improve the odds. For a 6/49 system the winning odds for any prize is 1 in 33. So if you want to test your chances to win back at least the price of your ticket, which is the smallest prize, make a 33 tickets lottery with a single winning ticket and make sequential drawings. You can test if the statistics applies to your luck. But remember the odds are for winning any prize, including the free play wins. For the same 6/49 lottery system the odds of winning the Jackpot are approximately of 1 in 14,000,000. That is impressive isn’t it? Picture yourself surrounded of 14 million balls with only one winning ball. Just to count to 14 million will take you a few months if you count for 8 hours a day. There are many people that think that Lotteries have a way to manipulate results? The balls used by lotteries are supposed to be perfectly equal, so that pure luck determines what balls will get drawn. However, people think that in reality the balls are not perfect, so some balls have higher chances to be drawn than others. This is normally fixed by lotteries by rotating the balls sets on a regular basis. Speculating on this, there is a discussion about improving the odds to winning. By maintaining the historical data, and comparing the results, one could theoretically establish a pattern of how the sets are rotated, hence getting slightly better chances to winning. There actually exist a few ways to improve your chances to win and I will reveal them here. These chances can be mathematically calculated. One common way to improve the chances to win at Lottery is to play more at once. The more money you play for a single draw, the better chances to win. I will give you the example with the 33 tickets. If you can chose 10 tickets of the 33 you will have 10 chances in 33 to find the winner, that means about 1 chance in three. On the contrary if you pick on ticket at a time and then remix the tickets you will have, each time, one chance in 33 to get the winner. I explain here more tips on how to win on mega millions or any other lottery. Actually, the posts shows ways to improve your odds to win to lotto. We usually don’t afford to spend too much on Lottery, but next time you play, instead of spending 2$ each week you could spend 15$ every two months. Another alternative would be to associate, and play in groups. 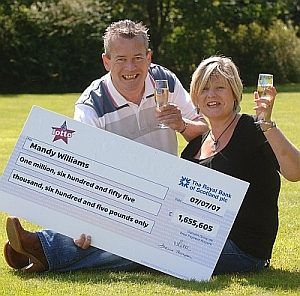 Lottery syndicates are a very good way to improve the winning chances. Of course the prize will be split between all the members, but you win. There has been a lot of debate around the question if we should stick to one single set of numbers or change the numbers every time. This is will be the subject of another post.